Liberals are like the man who kills his parents and then pleads for mercy on the grounds that he’s an orphan. The ideology arose out of the fierce struggles against the ancien régime in the 17th and 18th century. Yet once it reached maturity in the mid-nineteenth century, it dedicated itself to forgetting that had ever been the case. In England, the Victorians tried to cover up a century of political turbulence that began with the outbreak of civil war between Parliament and the crown in 1642 and did not end until 1745 when “Bonnie Prince Charlie,” leader of an army dedicated to restoring the old Stuart dynasty, advanced to within 200 miles of London before being defeated in the Battle of Culloden. A hundred years later, the Victorians had decided that civil war was inimical to the British character and that radicalism was for other people, most notably the ever-excitable French. Across the channel, collective amnesia was not so easily gained since memories of La Terreur were still so fresh. Liberals agonized, consequently, over how to achieve stability with royalists and republicans still going at one another in the streets. How could France detach itself from its revolutionary past when the old battles were continually erupting anew? The ultimate self-made orphan was Alexis de Tocqueville, whose Democracy in America, published in 1835-40, is still the book that American exceptionalists most love to quote. As the noble particle suggests, Tocqueville was born into an aristocratic Norman family going back to the days of William the Conqueror. His father narrowly escaped the guillotine in 1794, his hair supposedly turning snow white from the ordeal, but other relatives were not so lucky. The experience could have turned Tocqueville into a royalist, but instead he made peace with the new regime, swearing allegiance to the liberal “bourgeois king” Louis-Philippe after he took the throne in 1830. Democracy, he believed, was unavoidable in the new age. But he wanted democracy shorn of the revolutionary sturm und drang that had ushered it in. Hence his fascination with the United States, a new republic that had seemingly entered into the new age effortlessly and painlessly. “The circumstances that accompanied their birth,” he said of the modern nation-state, “…affected the whole term of their being.” Tocqueville was especially taken with the New England Puritans as the people who planted the seeds of democracy in the New World. Unlike the paupers and adventurers who flocked to Virginia, they were members of the educated middle class. Immediately upon landing at Plymouth Rock, the Pilgrims (actually a branch of the larger Puritan family) promised to “combine ourselves together into a civil body politick, for our better ordering and preservation, and … enact, constitute, and frame such just and equal laws, ordinances, acts, constitutions, and offices, from time to time, as shall be thought most meet and convenient for the general good of the Colony: unto which we promise all due submission and obedience.” This was popular sovereignty avant la lettre, and yet it all just fell into place without the assistance of the guillotine. By 1650, the Puritans were instituting compulsory education and fining parents who failed to comply, levying taxes, appointing clerks to record births, marriages, and deaths, surveying property, and supporting the poor, all at a time when royal absolutism in Europe was crushing local liberties underfoot. 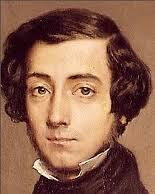 American democracy was born rather than made, which is why Tocqueville found it so fascinating. Instead of revolting against the past, Americans continually sought to return to that halcyon period in the 17th and 18th century when popular self-government was at its purest. Tocqueville longed for something similar in France, yet revolution and democracy at home were two sides of the same coin. During the Revolution of 1848, he argued for an American-style constitution with a bicameral legislature and an elected presidency, but got nowhere. Then, as the revolution heated up, he supported General Cavaignac’s crackdown on the Parisian workers, backed restrictions on civil liberties, and in June 1849 pleaded with the interior minister, Jules Dufaure, to impose a state of siege and prohibit demonstrations. After calling for a Bourbon restoration against Louis Napoleon’s in 1851, he was forced into retirement. Tocqueville thus turned against the revolution that had made democracy in the first place and then pleaded for sympathy against Napoleon III’s coup d’état. Not much to be proud of here. Post-1945, however, the United States has imposed a generally Tocquevillian agenda, not only in France but throughout the world, based on a concept of conservative democracy in which popular sovereignty is all but eliminated via entrenched constitutional guarantees, international agreements, and so forth. The aim was to rule out revolution as unnecessary and even un-democratic unless directed against the tottering post-Stalinist regimes of Eastern Europe, in which case it became de rigueur. Personally, I’ve always thought that Democracy in America was overrated and that Frances Trollope’s Domestic Manners of the Americans was not only better written and more informative, but much more fun. But Trollope doesn’t fit the American political agenda the way Tocqueville does and so remains less well known.